Paul Chavasse is an agent for The Bureau. The Bureau is a highly secret member of the British Intelligence community, in place to handle those cases which are too sensitive for more known agencies like MI-5 or MI-6. The Bureau operates out of a fine house in London disguised as Brown & Company, Importers and Exporters. The department is a small one with just a few operatives. In the first adventure, Chavasse complains to the "Chief" when given a new assignment fresh off a particularly hard one and asks why not send another agent, mentioning two in particular, only to be told that one was likely dead and the other relieved due to stress, leaving Chavasse to take the job. He has for many years prior to the start of the series worked for this clandestine arm of the British government. He has been sent around the world to handle cases that either others have failed in or that others don't want to touch or be seen touching. Chavasse, the product of a British-French union, is said to speak more languages than “you’ve had hot dinners.” He also has achieved, apparently, several university degrees over the years. All this while still being one of the most deadly enforcers the government had. It was the languages and the education that attracted the Bureau to recruit him, pulling him out of a professorship in a provincial university. He longs for the chance to return to that quiet life but he knows he would quickly grow too bored to enjoy it. Some of the original publications of the chronicles of his actions were reprinted with additional material, taking place during the present and reviewing the past events. According to these, Chavasse would go on to be knighted by the Queen and serving for over 20 years, after his time with the Bureau, as a Bureau Chief in Belfast during the heat of the IRA troubles. Caspar Schultz was a die-hard, unrepentant Nazi with considerable information regarding what happened to other Nazis at the end of the war. He has also written a manuscript in which he clearly lays out the truth. Now those named want the book destroyed and the Bureau wants Paul Chavasse to get it first. German scientist Karl Hoffner possesses a keen insight in the matter of space exploration. The British and Americans want that knowledge. So do the Soviets. Unfortunately, the doctor is deep inside Tibet, surrounded by Chinese agents who want neither side to succeed. The Chief of the Bureau had a “simple” job for Paul Chavasse – slip into Albania and eliminate a double agent. Unfortunately, someone has set a trap for Chavasse, someone who has harbored a deep hatred for a very long time. Max Donner was a very rich man who used his financial power to put together his own army. He was then ready to extend his powerbase by stealing the government’s newest missile technology unless Paul Chavasse can stop him. Stopping Chavasse, however, is Donner’s luscious daughter. Paul Chavasse goes to considerable trouble to stage a very difficult bank robbery netting tens of thousands of pounds and, more importantly, a trip to prison when he is “captured”. This all to work his way into the Organization to foil a power play that has international repercussions. When Special Branch found the rotting, eaten body of a gangland leader, it decided the case was too much for it to handle so it went to the Bureau. Paul Chavasse remembered the last time he helped out that group and the idea of more prison time is not appealing. 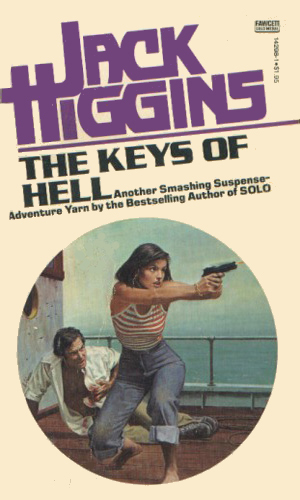 Early in the writing career of Jack Higgins, during the heyday of James Bond fever, he wrote a six-book series about an impressive agent named Chavasse. They apparently did not set the world on fire and most came and went. That was lamentable. 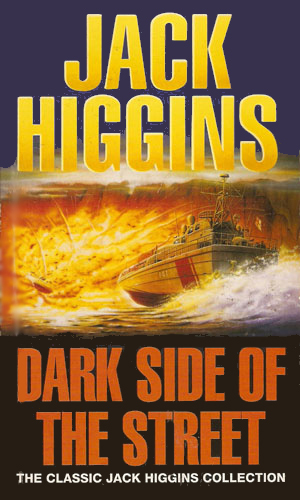 Years later, with Higgins’ great success with one best seller after another, publishers understandably craved more works to feed the public. 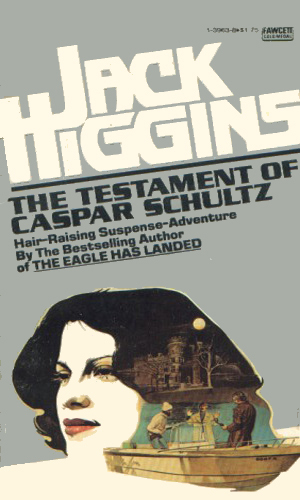 Luckily, the Chavasse books were resurrected and, with the addition of additional material before and after, were again available to fans of spy-fi. This is a very good thing. Reading the Chavasse adventures is like going on a pleasant jaunt, not particularly taxing and filled with enough pleasure to gladden the heart. Each book can be read in a couple sittings and you tend to smile at how well Chavasse handles things. Smart man, Mr. Chavasse. 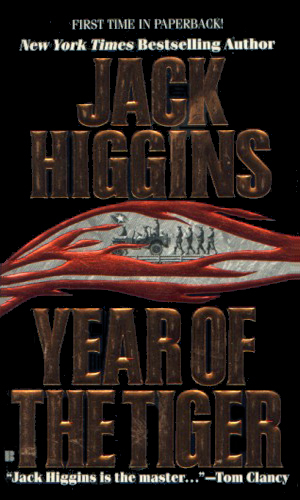 Good writer, Mr. Higgins. 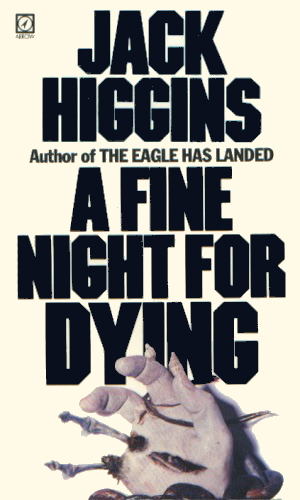 Very good early Higgins. If you've read much of his later work, you will recognize Mr. Chavasse. 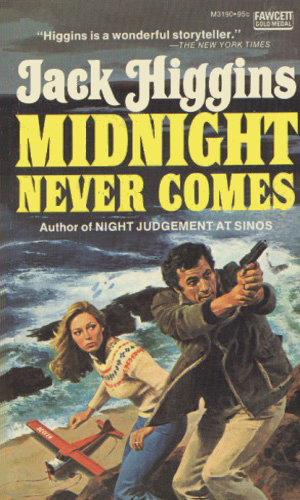 Enjoyable reads from the 60s. Recommended.